Pay attention to one of the main startup Business Plan mistake ! A common mistake VCs can see when looking at startups business plan is the underestimate of C.A.C. (Customer Acquisition Cost) projection: C.A.C. evolution is not linear. When I see a startup with little revenues telling me that they will be able to grow at limited costs because their C.A.C. today is low, I know by experience that it won’t be so easy. The curve below presents the way C.A.C. evolves depending on the number of customers you have. I have seen this trend in most of the startups. 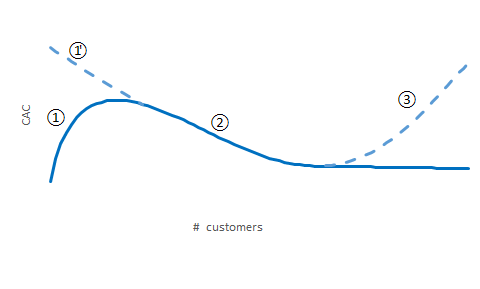 Many CEOs present their BP with a curve starting as ①’, spending a strong energy (cost and time) to catch the first customers and expecting this effort to decrease for the following ones. If this sounds right in theory , reality is a bit different. In ① phase, your product will reach early adopters at low cost and you will quickly see that C.A.C. increases to attract new users. One of the main reason is that your first customers are probably startups or groups met in incubators, accelerators or in meetups and people in your first or second circle of acquaintances. At this point, your business has not shown its scalability yet. Another bias is that you probably don’t take into account in your C.A.C. computation the main growth source, which is founders time. Moreover, today, efforts to reach customers are increasing due to high competition as a result of software development costs lower than ever, so normative C.A.C. can be higher than you think. When you have a comfortable user base as in ②, C.A.C. decreases with volumes by improving acquisition efficiency, segmenting customers, and increasing referrals. You can boost your acquisition budget and grow in a cost-efficient way. This Tomasz Tunguz article shows it perfectly post series A funding http://tomtunguz.com/segmenting-saas-growth/, which is usually around 100k MRR. You can improve your C.A.C. only if you consider acquiring customers at a reasonable pace. If you try to boost significantly acquisition over a short period, elasticity of demand will make your C.A.C. probably strongly increase. Once reached a significant market share, C.A.C. will increase as in ③ to reach additional users. You’re on the mature phase of your activity which has supposedly turned into a cash cow. If you are in a niche market, you should quickly identify this threshold to slow down marketing and sales investments, in order to increase profitability and prepare the future by refocusing on new businesses or customers. If you manage to raise money with an underestimated C.A.C., you will soon be short in cash which may screw up your company. So pay attention about cutomer acquisition costs projections when building your business plan ! Don’t hesitate to send your Saas company BP to our team by email : contact@techmind.fr.